good question. Just for the heck of it I flipped through my 1990 dealership brochure (no reason I chose that one other than it was next to me) expecting to find it but I don't see mention of a sunroof anywhere. it might be that it was a dealership-installed item. If that was the case, than any MJ had the same chance of getting one. Ok, thank you. I was hoping it was factory since mine is currently leaking. Figured if it was, someone would’ve tackled this already. 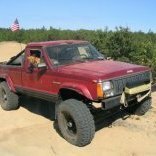 Mine had one (87 Sporttruck). By all accounts, it looked factory installed to me. It didn't leak, but the latch mechanism eventually broke so it wouldn't stay locked in the open position. Replacement parts for it seemed universally unavailable, so I just rigged it when I wanted to open it (which wasn't very often). We used to install sunroofs in vans an trucks,and did some van conversions.For the dealerships around Johnston city,Tenn. If your sunroof is good its not that hard to seal,but you will have to take it out.In the 80's a lot of company's went to Silicone to seal them to the cab.This is a bad Idea in most states,( hot,cold,hot,cold) this stuff dosn't last.Peals up from around the sunroof,and starts to leak.The best stuff to use is an oldschool window caulk that comes in a roll,and dosn't dry hard.If its leaking around the glass seal use some petroleum jelly(water proof grease works too). Just put a good coat around the edge were it seals into the aluminum frame,close it,and wipe off the extra.Let it sit a couple of days,(not in direct sun).Then open it up and wipe it off.That should soften the old seal,and stop the leak.If the old seal is cracked on the outside from the sun your pretty much screwed,unless you can find a better replacement that's option 1.Your 2nd option is to take it out,and replace the section of roof.Option number 2 is never any fun.I hope this helps you out. This is very good information, thank you! That's no problem Rubikahn. One of the side affects of being old bro. I'm getting ready to do the 2nd option here on an XJ. I was thinking about putting the sunroof back in after I cut through the inch of Bondo someone put on the roof to blend it to the sunroof.Hello the sunroof is supposed to be higher than the roof.It helps the water run off when its sealed right.This guy call's himself a body man too.I had to laugh,because they told us in school.Anything over a 1/4 inch will not last more than a year or so.This XJ is proof of that for sure.So I may have an extra sunroof in good shape if someone needs it to replace there old one.I have to see whats under the mass of Bondo first. yeah, XJ roofs need XJ sunroofs. that "corrugated" roof structure is a real pain and so normal ones won't cut it. MJs can use regular sunroofs. Pete's right on that one.The MJ roof is nice,and flat if you use the right stuff to seal the sunroof it should never leak around the sunroof again.Then is on the seal,and the hold downs.The XJ's you can seal if you know the tricks of the trade.Most were installed with Silicon,and will never seal right,because of the corrugated roof.Not to mention most sunroofs are flat faced. Easy fix most don't know. Put a small strip of the tape between the corrugation(the same old window tape),maybe two your trying to build the roof level. Then put your tape around the sunroof,and press it into the hole. This is were an extra set of hands comes in. While you are pressing the sunroof down.your buddy puts the bottom ring in place lines up the holes,starting at the corners,and work to the middle of each side. Putting the screw's back in. You should notice that as it gets tighter the tape will squeeze out.When he's all done take a small awl or screwdriver run it around the edge of the sunroof.Peal the extra up,and roll it into a ball.Then you can throw it away,or at your buddy your done. Great thing about MJ's you only have to go around the sunroof,and fallow the other step's.